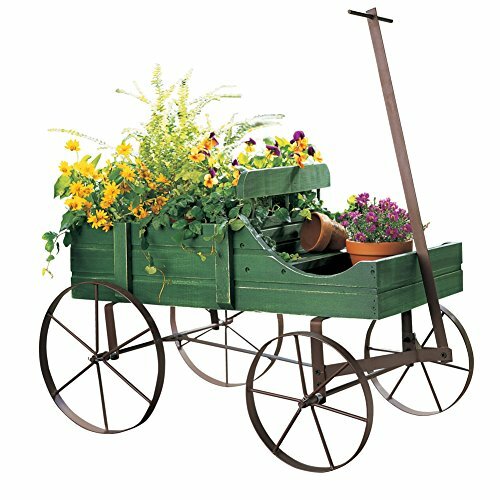 Is it time to think of some new ideas for your garden? Whether you have a large space or just a few pots, you can make a difference. In fact, you can make a big difference to hundreds of pollinators. Choosing flowers that attract honey bees to your garden is a wise choice for any homeowner. A great non-beekeeper way to help bees – but we beekeepers do it too! And you don’t have to be a Master Gardener to grow flowers that bees like. Adding just a few to your garden, lawn or stoop will make some bees very happy. It’s not just about honey bees either. This is a great way to help all bees and other pollinators. The best location to plant flowers that attract bees is well away from narrow sidewalks and play areas. The bees attracted to the flowers may feel threatened. Leave plenty of walking space. This reduces the chance of accidental stinging. Honey bees are not aggressive away from the hive. But, they will defend themselves. As long as the foraging bees feel safe, you can safely observe them as they work. I have a motto, “If I have to dig a hole to plant something it better feed the bees or me – even better both of us”. When we talk about planting flowers that attract bees, we are usually not talking about a vegetable garden in your front yard. But hey, what’s wrong with that? Ok, its not for everyone I understand. But I sometimes think we need to move away from manicured lawns and leave in a more natural state. Honey bees, bumble bees and other pollinators benefit from a variety of nectar and pollen sources. 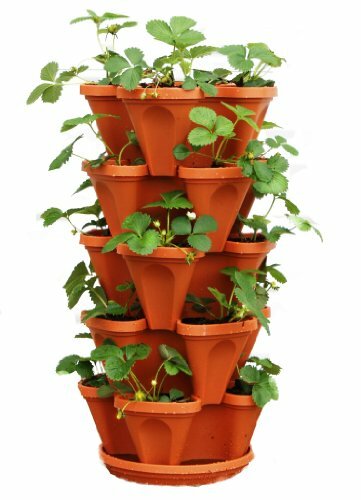 Each type of flowering plant produces nectar or pollen with different vitamins, minerals etc. Healthy bees need diversity in food sources. This is why commercial hives used for pollination sometimes suffer poor health. There may be plenty of food available but it is all the same. Our mono agriculture system plants large plots of one thing. This limits the diversity of bee diet. 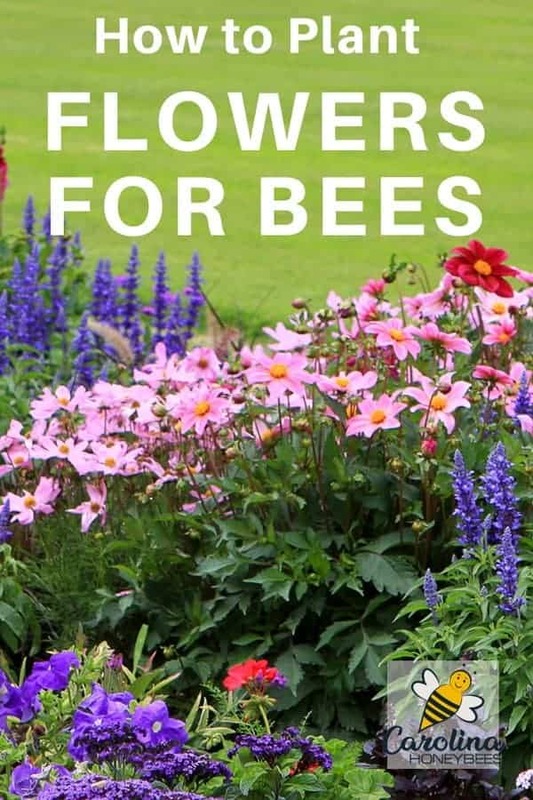 Mix it up and choose bee friendly flowers of different kinds. Even if you can’t be a beekeeper, you can still help the bees. Choose a wide variety of flowers that attract bees or butterflies for different parts of your landscape. 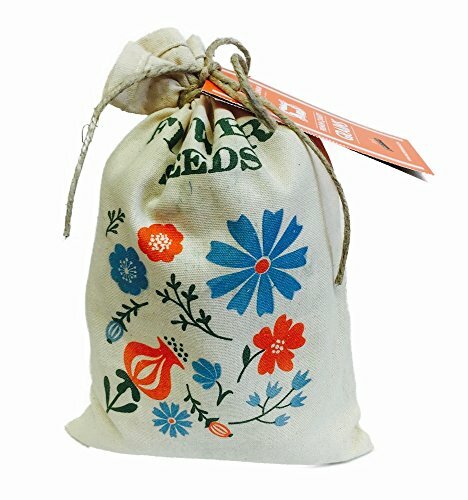 If you have an area that is hard to mow or maintain, is it a great place for a mini meadow of wildflowers? Plant selection is not limited to small plants. Trees that produce nectar are a valuable bee forage solution. Of course, not everyone has room for trees but if you do, consider planting a couple of trees for the bees. Container gardening can also make a good contribution to nectar and pollen supply. City dwellers provide a much needed food supply to urban honey bees. Bees fly so rooftop gardens must seem like the best buffet bar ever! Do Wild Flowers Attract Honey Bees? 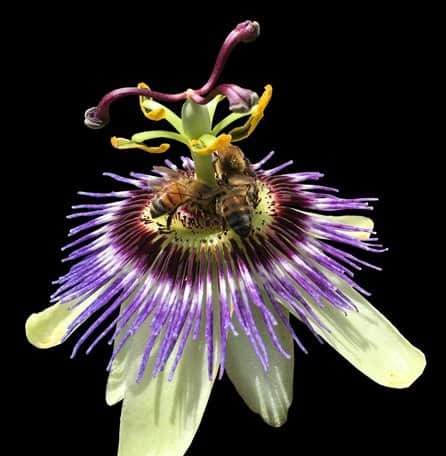 Passion flowers – one of the flowers that attract bees. You may wonder why you need to plant for bees? Don’t wild flowers and native plants attract bees and provide food and cover ? Yes, they do. Unless you live in the city, you can likely look around and see many plants and flowers of all sizes. Are you into native plants? That’s great, they too can be a food source. One important consideration is that not all blooming flowers produce pollen or nectar. And many wild plants have a short bloom time. This is the situation at my home. In April, I have so many blooming plants that the bees cant possibly keep up. But when hot, dry July arrives, I am in a nectar desert. It’s not just about nectar. Bees need a variety of pollen resources too. Pollen is an essential protein source for bees. Early blooming daffodils are beautiful harbingers of Spring but produce no nectar and not a lot of pollen. Remember that blooms don’t always mean food for bees, some varieties of plants have been bred to lack pollen! Honey bees are at the mercy of the natural bloom cycle and environmental pressures. In these situations, even a few flowers that attract honey bees to your garden can make a big difference. In upstate South Carolina and many other parts of the country, there is a major blooming season. This is a season of plenty when the bees have an abundant supply of nectar producing flowers. Red Bud Trees, Blueberry, Henbit, Blackberry and others bloom in the same time frame in my area. I could have 200 beehives on site during this heavy flow. But there are some times of the year when the site might not feed more than 20 hives. The takeaway point is that most flowering bee plants do not bloom all summer long. Planting flowers that attract honey bees may help small colonies in peril. Also, if we provide nectar producing flowers that bloom throughout the summer this is better than having all of them bloom at once. It avoids the bee colonies having to deal with “feast or famine”. Plants and flowers that are beneficial to bees can be planted throughout the year in most locations. Fall is a great time to install large plants such as trees. When we are planning for pollinators don’t forget to think BIG. It is not just small blooming plants that provide nectar. Trees may bloom for a shorter time frame but they can produce large quantities of food. 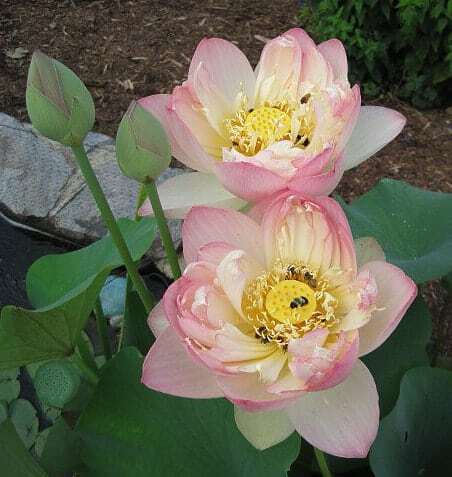 My Lotus flowers attract honey bees. Your tree selection will of course depend on the climate or planting zone where you live. 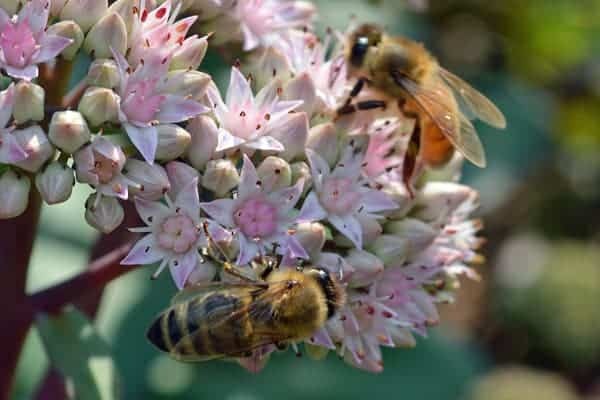 Some common trees that provide the best flowers for bees are in our area are : American Basswood, Southern Magnolia, Sourwood, Cherry, Red Bud, Crabapple, Serviceberry and Tulip Poplar. Chose a tree that is suitable for your growing conditions. In just a few years (or sooner), you will have a bee buffet in your backyard. If you do not have room to add trees, you can still help the pollinators. Sedums can be found in most garden center. My honey bees seem to enjoy the sedum variety “Autumn Joy”. Sedums are an ornamental easy to care for plant. They are drought tolerant and thrive on neglect. Autumn Joy sedum offers a food source when other plants have dried up due to lack of rain. Avoid plants that have highly hybridized. These plants are developed to look beautiful and not produce seed. (Some homeowners dislike messy seed pods). While this may look great in your garden, these plants produce much less to no pollen. Your local garden center is a great place to begin your search when planting flowers that attract bees. Even if there selection is small, they will be familiar with growing conditions in your area. Another great resource is online ordering with its great variety. I want bees and flowers in my garden. Every little bit of bee food helps all the pollinators. I’m just learning to plant for the Bees. So I’m trying to plant as many trees, flowers, and bushes for the Bees as I can that they like. Any help would be greatly appreciated. I have an acre and a half now. Choose a variety of simple flowers (avoid new hybrids if possible). Trying to choose flowers that bloom all Summer or varieties that stagger their bloom time would be part of a good plan too.